I am so ready for fall! SO ready! My mind is on crumbles, and crisps and cobblers, oh my! I found some nice fruit the other day and undoubtedly knew what I had to do with them! The plums, the peaches, just beautiful. My husband had been mentioning that I hadn't made a dessert lately and how "good it sounded". You know wives that is code for, "please make it now". And with a face like his, how could I say no?!?! You can use other stone fruit in this as well, I just used peaches and plums. It came out delish, and with a scoop of ice cream on top.... get outta here! 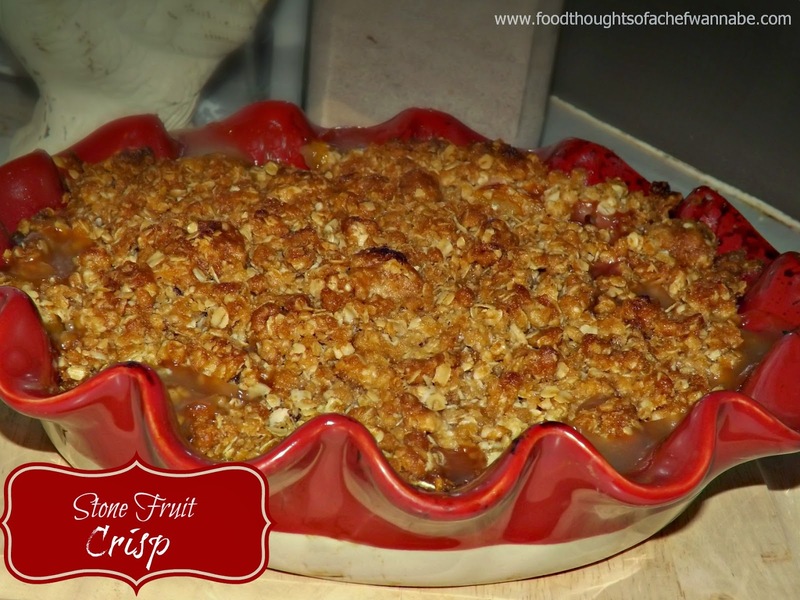 Perfect crumbly, crunchy top, sweet fruity bottom, the texture was awesome and so was the flavor! By the way, on a side note. When I typed out "fruity bottom", my head started singing, "apple bottom jeans and the boots with the furrrr"
I don't like fruit, remember? Yea well, I ate this. (insert awkward silence where you all are gasping in shock) I KNOW! Mix ingredients together well. Pour into a casserole dish that has been buttered or sprayed with nonstick cooking spray. Preheat your oven to 375 degrees F.
Using a fork, mix all ingredients until well combined, and it becomes crumbly and holds together when you press it together in your hand. Sprinkle over the top of the fruit, covering the entire top. Place on a cookie sheet in case it bubbles over and bake for 45-55 minutes. Let cool 10 minutes before serving. Enjoy this fruity goodness over some ice cream!